Over a decade ago, I discovered I have a problem. I love to photograph grilled food. Sure, I may sneak in the occasional salad, but for the most part, my collection of images include food with either a grate or grill marks. It’s a serious condition. As the Grillographer of Weber Nation, capturing dinner on the grill is often an involved process. Not only am I worried about dinner, but I also have to take into account cameras, lens, lighting, reflectors, and diffusers. It can literally be a production. Ironically, however, some of my favorite images aren’t from my DSLR, but rather my phone for Instagram. Over the last few years, I’ve watched and connected with thousands of Weber enthusiasts who take to Instagram to share their grilling conquests. An easy search of the hashtag, #WeberGrills, can give you an idea. If you are looking to share that ultimate ribeye from last weekend or those sweet and tangy ribs you smoked yesterday, Instagram is where you will find your grilling, smoking, and Weber family. Whether new to the photo sharing platform or just starting out, here are some tips to make your next grilling feast Instagram-worthy. Light: One of the most important elements of a great photo is good quality light. While a flash mounted on your camera or phone certainly provides light, it’s the last thing we want to use when photographing food. Natural light works best and better yet, plenty of it. Without enough light, images can come out dark and grainy. Dinner is the best time of day to capture photos, especially as the golden hour approaches. The golden hour is the time before sunset (or after sunrise) where daylight is softer and warmer. The dramatic lighting this time of day and can add a lot to an image. Seize it. I also recommend backlighting the grill. 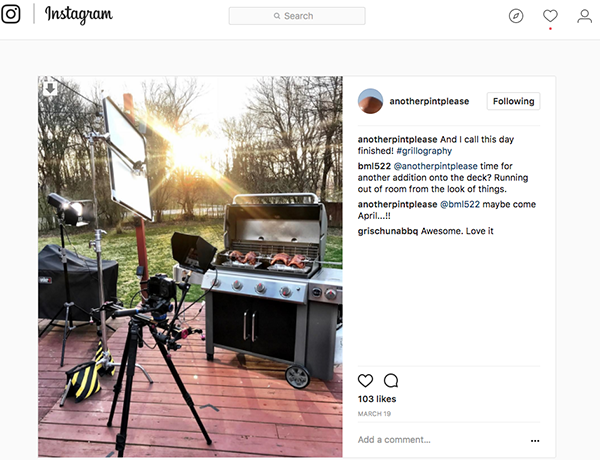 By moving the grills around, so the setting sun is behind the food, shoot towards the light source to create a more interesting image versus just filling the grill with light. Try it both ways and see the difference for yourself. Get in close: I approach my grillography like a National Geographic photographer approaches wildlife on the Serengeti. I get in as close as possible to capture as much detail as I can. Sure, there are differences. I'm walking out the back door and not traveling halfway around the world. Also, and most importantly, I'm the one doing the eating when the shoot is over. A steak centered on a kettle looks good. Fat dripping off a steak resulting in a short flare-up from the coals below looks great. Keep your head down, and get in there. Another benefit of shooting with a phone is the ability to shoot crazy angles not otherwise possible. While food is traditionally shot either from above, straight on, or at a 45-degree angle, the compact size of a phone allows for a lot more variation. Experiment and have fun. Make the grill alive: Just as described in the “get in close” example above, a steak can look good on the grill, but it can look a lot better when something is happening. Without a hint of flame, grease, or smoke, the steak may look static and worse yet, as something cooked hours ago. Wait for the picture with licking flame or rising smoke. Those images are alive. My most engaged photos are almost all on the grates and feature something that makes them spring to life. It might be a wisp of smoke, a drip of fat, or a shooting flame. My litmus test? Does this photo make me hungry? Take lots of pictures: The “alive” shot can be elusive, which is why I take a lot of photos. While I may only post one picture of a meal, I probably took over thirty to get that “one shot.” Don’t settle for one click of the shutter. Take one, take twenty. Workflow: I take images with my phone’s native camera app. From there, I apply my own post-processing adjustments through third party apps like Lightroom, Camera+, or Darkroom. I like to increase the saturation and vibrancy while tweaking the contrast to make the image pop. At the bare minimum, take a photo within Instagram and apply one of their photo filters. While a lot of their filters can help a photo, I prefer my own touch and bypass them. In the end, experiment and go with what works best for you and more importantly, makes you hungry. Hashtags: The best way to find fellow grillers and likewise, share your photos with the greater community, is to use hashtags. Grillings ribs? Use #ribs. Cranking out some steaks? Be sure to include #ribeye. Smoking pork? Try #bbq #pulledpork. Of course, no matter what you are grilling, share your Weber love and don’t forget to #grillon. 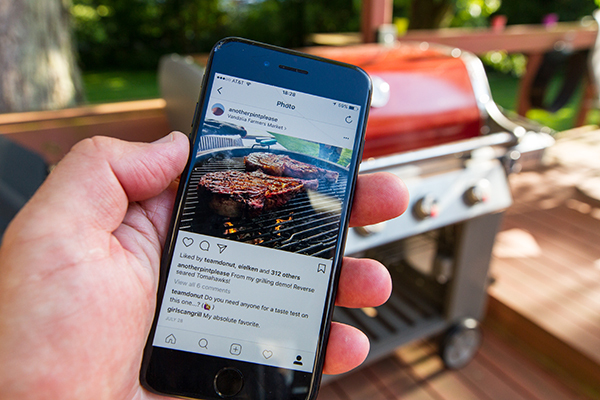 Next time you fire up the grill, grab your phone and start adding to your Instagram collection. When you do, make sure you follow and tag not only our Weber feed @WeberGrills, but me, @AnotherPIntPlease. We can’t wait to see your work!